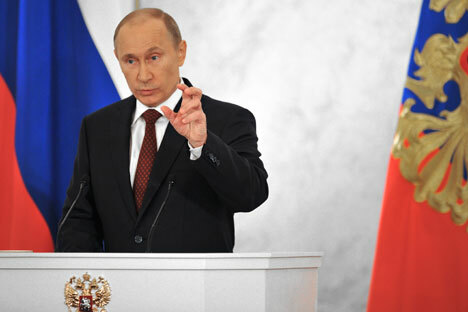 The percentage of Russians who are ready to vote for Vladimir Putin in presidential elections has increased to 75 percent against 70 percent in February, the Public Opinion Foundation has reported. This figure is the highest since 2008 (60 percent). In January 2014, 46 percent of the respondents said they were ready to vote for Putin, against 58 percent in March 2014 and 73 percent in December 2014. In the poll, which surveyed 3,000 respondents living in 204 populated areas in 64 regions of Russia, which was done March 21-22, the respondents were asked which politician they would vote for if presidential elections were held in Russia the next coming Sunday. Four percent of the respondents said they would vote for Liberal Democratic Party leader Vladimir Zhirinovsky, 3 percent said they would vote for Communist Party leader Gennady Zyuganov, and businessmen Mikhail Prokhorov and A Just Russia leader Oleg Mironov received 1 percent each. One percent of the respondents said they would spoil their ballots, 9 percent said they would not go to vote, and 6 percent were undecided. The poll showed that 86 percent of the respondents trust Putin and 40 percent trust him unconditionally. The same percentage of Russians (86 percent) believe Putin is doing his job as president well.